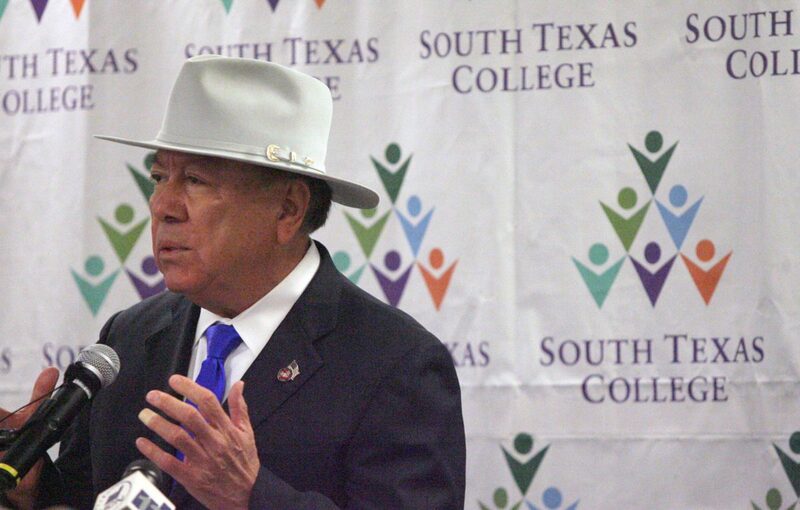 MCALLEN, Tx- Senator Juan Chuy Hinojosa speaks to the crowd that gathered for the announcement of the passage of SB 2118 that permits community colleges to offer certain baccalaureate programs Monday, June 26, 2017 at the STC Campus on McColl and Ridge roads in McAllen. AUSTIN — Lt. Gov. Dan Patrick appointed on Friday State Sen. Juan “Chuy” Hinojosa, D-McAllen, to co-chair a committee researching public accessibility to emergency calls in which the caller died. The Joint Interim Committee on Disclosure of Emergency Call Information will spend about 16 months studying the release of such recordings, a press release from the senator’s office read. As it stands, the audio recording or transcript of any emergency call can be obtained through a public records request. “This is an extremely sensitive and challenging issue in that we must balance our First Amendment rights and the public’s right to know, with the personal privacy of families who have lost loved ones in a tragic situation and have had their anguish recorded and replayed through the disclosure of a 911 recording of a loved one’s emergency call,” Hinojosa said in a statement. The committee, which includes State Sens. Donna Campbell, R-New Braunfels; Bob Hall, R-Edgewood; Don Huffines, R-Dallas; and José Rodríguez, D-El Paso, will be tasked with developing recommendations for the 2019 legislative session about when these recordings should be released. During the 2017 legislative session, Hinojosa and State Rep. Todd Hunter, R-Corpus Christi, authored a bill calling for the creation of this commission. It passed both chambers of the Texas Legislature in May. The committee will “study the process, rules, handling and processing of the disclosure of recordings and transcripts of emergency calls made by a subsequently deceased individual to a public safety agency or a public safety answering point,” according to the resolution. Hunter also authorized House Bill 3640, which would have made all emergency calls confidential. As per the bill — which failed to make it to either the House or the Senate floor for a vote — these calls could only be released under one of three circumstances: the requestor had the consent of the caller, or the caller’s legal representative; the requestor was a licensed investigator who needed the information for a court proceeding; or the requestor was a first responder. One idea discussed by the House’s Homeland Security and Public Safety Committee was to only make the audio recordings confidential, but to allow the transcripts to be available without exception, and give law enforcement agencies the discretion to determine when the release of a call was in the interest of public safety. “We must come up with a solution that protects the privacy and heartaches of the families who have lost loved ones, while at the same time protects the public’s right to know,” Hinojosa said in the statement.